Apparently blintzes are Eastern European in origin and were brought to the states by Jewish immigrants from that region. And they're apparently traditionally consumed on big holidays like Hanukkah. And at the risk of sounding like another very articulate Pennsylvanian, I'll refrain from using the word "apparently" for the rest of this post. I'm actually like 1/16th Jewish through my father's mother's branch of the family, by way of Germany. And Hanukkah starts in just over a month. So they may not have the seasonal appeal of pumpkin or pecan, but I just want you all to know that it's not entirely inappropriate for me to review these tasty wrapped pastry pancakes now, particularly for those of you who want to try some foreign-inspired cuisine this holiday season. The blintzes, or "blini," are wrapped in a crepe-like shell that fries up nicely in a pan with oil or butter. I found myself heating them for a few extra minutes than what the instructions indicated, but maybe I wasn't using enough heat. As I've mentioned before, I'm not particularly skilled in the kitchen. But at any rate, they turned out to be pretty scrumptious. I just waited until the middle was soft and the outside medium-brown and then took them out of the skillet. 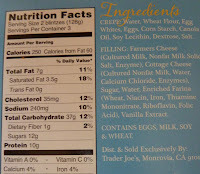 The filling is something like a sweetened cottage cheese, although much more tasty than that probably sounds. 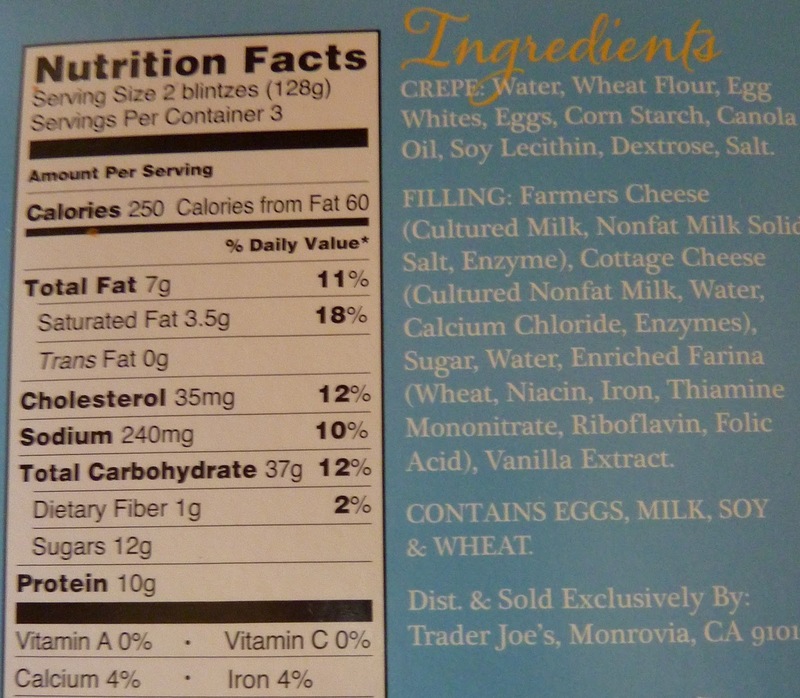 It was like the illegitimate lovechild of cottage cheese and cream cheese, with a little sugar all up in the mix. Although these little guys are rolled up like some funky foreign hot pockets, the overall effect is like a dessert crepe. I haven't tried it yet, but I bet these would be killer with some homemade fresh fruit jam or pie filling on top. Sonia's down with these kosher blini, despite a slight aversion to the texture of the cottage cheesiness. She gives them three and a half stars. I'll raise her half a star. Four from me. Can't stop the blintz. From my experience with blintzes, they go fabulously with jam or pie filling. In fact, in standard groceries, they are available with cherry or blueberry filling, without the cottage-cheesey interior. Cherry filled is my favorite. Cherry filled would be awesome! Hanukkah is a pretty minor Jewish holiday that got built up in the U.S. in recent years. 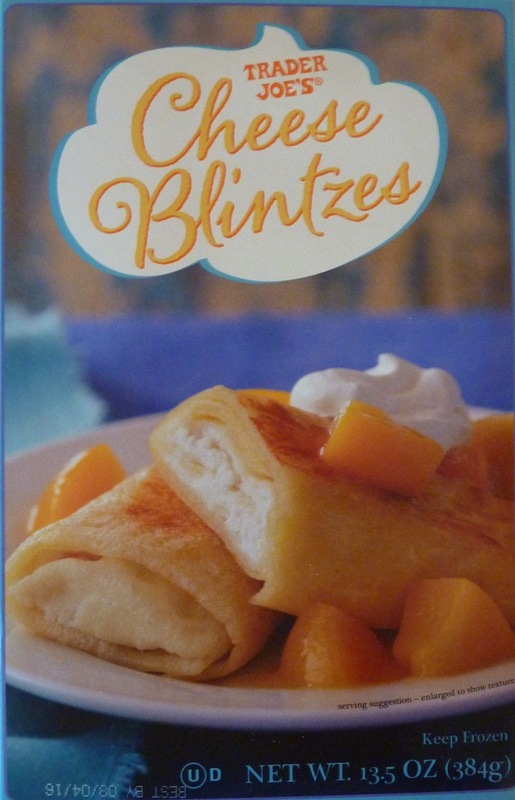 Mom liked blintzes, but the rest of us didn't care for them. So they just sat in the freezer. Blintzes are much more common on Shavuot instead of Chanuka (look for latkes for Chanuka), but they're delicious anytime! But wikipedia told me you eat it on Hanukkah, so it HAS to be true! Kringles are back at TJs!!! They're pretty great with lemon curd too! 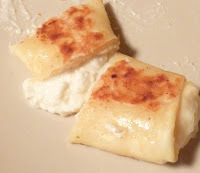 Cheese blintzes also taste great topped with powdered sugar and sour cream. I have had excellent results heating these in the oven until they are warmed through, then finishing in a pan with butter to crisp them up on the outside. They are indeed delicious with some cherry preserves and sour cream on top!